When I'm in no mood to cook an elaborate dinner, pasta comes to my rescue. We mostly prefer no-sauce pasta dishes over creamy, pesto or other sauce based pastas. When there is no sauce, the flavor comes from the vegetables, herbs and spices and each time you can create a unique pasta dish. While googling for quick and no-sauce pasta recipes, I stumbled upon this Nigella Lawson recipe. The original recipes calls for mushrooms steeped in oil, garlic, lemon and thyme which is then tossed in fresh hot pasta. I was not sure how raw mushrooms would taste, so I adapted the recipe slightly to suit our tastes. I tossed the mushrooms in olive oil and little butter and added more spices. 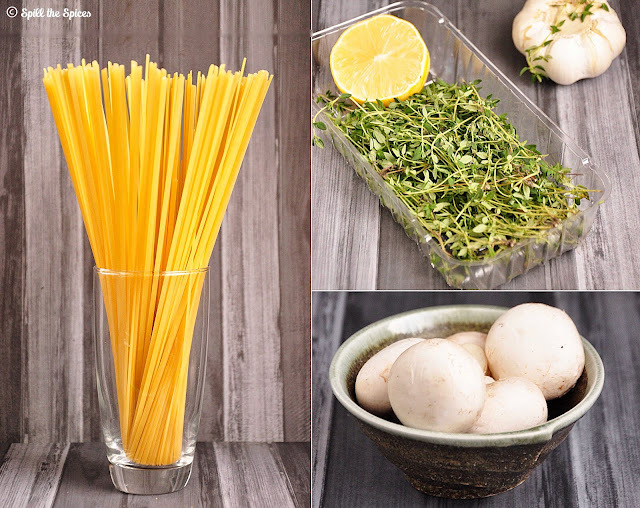 The lemon zest and juice added a wonderful freshness to the pasta. What I love about this recipe is how quickly it can be done - while the pasta is cooking, get ready the sauteed mushrooms. Off to the recipe now! 1. Cook the pasta according to the instructions given in the packet. Rinse under cold water and drain water completely. 2. Heat a large pan over high heat, add olive oil and butter. Add the mushrooms and toss well. Cook for 2-3 minutes without stirring. 3. Now reduce the heat to medium and add garlic, half of thyme leaves and mix well. Cook for 4-6 minutes until mushrooms have turned brown. 4. Add the lemon zest, red chilly flakes, salt, pepper and toss. Add the cooked pasta, lemon juice, remaining thyme leaves and toss well. 5. Cook for a minute and remove from heat. 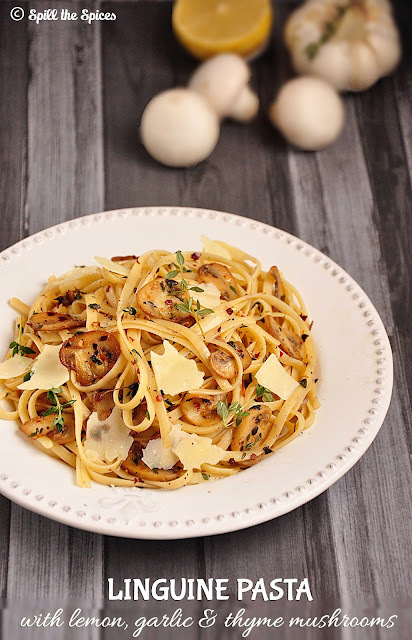 Top with shaved parmesan. 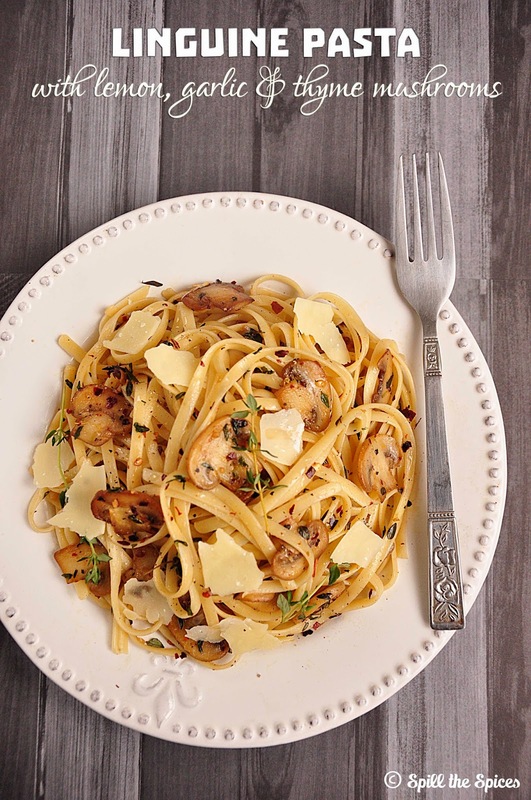 You can also use spaghetti or fettuccine pasta instead of linguine. To cook pasta al dente, cook the pasta 1 minute less than the recommended time. Finish off cooking the pasta in the pan. What a fantastic pasta..Loved the capture as well. pasta looks so tempting. Love the photos. Fell in luv vth pics,no words.. Pasta looks delicious. Nice combination of flavors and beautiful pics as always dear..
Lovely inviting clicks Sona. Pasta looks very delicious and tempting..
Gorgeous looking pasta!! Love the black & white effect!! Very tempting clicks, pasta looks fantastic..
Beautiful clicks Sona.. Pasta looks delicious, and full of lovely flavors. Feel like eating all the past right off the screen.. delicious pasta dear.. and superb pics too. Looks very nice.. simple one with just few ingredients ! The linguine looks amazing. I have not tried any pasta without the sauce so am tempted to make it soon.